The most common mistake people make in the stock market is the rush to make quick money. People are often hasty to invest huge capitals in expectations of higher returns without looking at the risks. 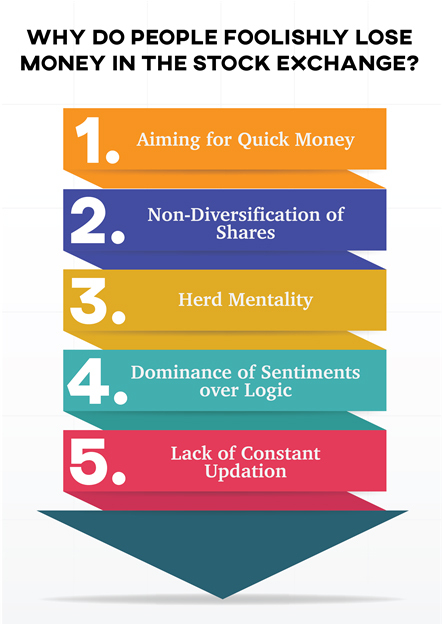 The web is loaded with dos and don’ts on the stock market. How much of it is legit? To be honest, even those who are familiar with the strategies and techniques often fail at stock trading. The question to address is, why do so many people lose money in share markets. The most common mistake people make in the stock market is to be in a rush to make quick money. People are often hasty and invest huge capital in expectations of higher returns without looking at the risks. Patience is the pre-requisite in the livestock market. However, people invest in stocks based on advice from friends, relatives, and other untrusted sources. They invest a huge amount in one stock, and when they are unable to make the expected gains, or sometimes lose out a considerable amount of money, they sell the stock out of frustration. Hence, people should have a more rational approach towards investment. If there is a boom in the IT industry, some people will invest only in IT companies. Similarly, many people spend all their money only in those sectors which are at their peak. This is risky, as the capital will be lost in a single go if the sector tanks. Hence, diversification of the stock portfolio is a must for investing not only in the stock exchanges but also in others securities. Many people invest in stocks because their friends or relatives made a lot by investing in those shares recently. This behavior is very common among investors and is prone to many risks. People whom others follow for share preferences have some strategy behind them, but they fail to understand this strategy and follow them blindly. Every investor should analyze their reasons and form a plan for his capital investments accordingly. With companies going global, any instability in politics, security, and demography will affect the market sentiments throughout the world. This leads to a market crash and loss of revenue. However, as per records, all incident does not lead to a market slowdown in others countries around the world. The people overreact to these incidents without logical analysis of the outcome. For example, the day Brexit referendum was to be declared, the stock market of many countries including India crashed. However, the next day market became normal without much drop in stock price. The reason being, it was a vote for Brexit and not the implementation, which would happen after two years. There were no immediate consequences. It was one of many incidents where people panic for no reason and lost money foolishly. Keeping oneself updated with world news and happening which helps in taking a minute but a critical and crucial decision. One who fails to stay updated often loses out in taking a proper decision during the critical trading duration and loses out money. Key to the stock market is gaining as much information as one can. More your knowledge, better will be your decisions.